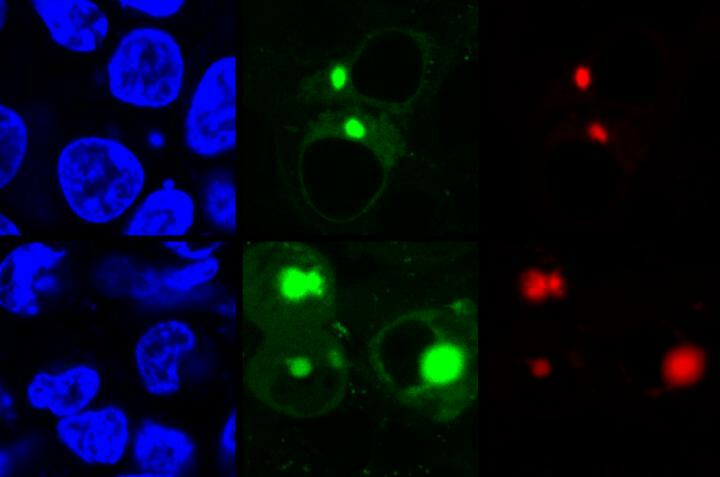 A new method uses fluorescence to detect potentially disease-causing forms of proteins as they unravel due to stress or mutations. A team of researchers from Penn State and the University of Washington reengineered a fluorescent compound and developed a method to simultaneously light up two different proteins as they misfold and aggregate inside a living cell, highlighting forms that likely play a role in several neurodegenerative diseases including Alzheimer’s and Parkinson’s. Two recent papers describing the method appear online in ChemBioChem and the Journal of the American Chemical Society. Previous techniques to identify protein aggregation used fluorescent compounds that were always lit up, which made it impossible to distinguish properly folded proteins from the intermediate form because both trigger low-level diffuse fluorescence. The AggTag method uses “turn-on fluorescence,” so the compound only lights up when misfolding starts to occur. To allow for this distinction between forms, the research team reengineered the color-causing core of the green fluorescent protein (GFP), which is commonly used in imaging studies because it fluoresces when exposed to certain wavelengths of light. The reengineered compound binds to a tag, which in turn fuses to a protein targeted for imaging. The research team used two different kinds of commercially available tags, Halo-tag and SNAP-tag, which when used with AggTag can induce red or green fluorescence, respectively. Because Halo-tags and SNAP-tags do not interact with each other, they can be used to simultaneously image two different proteins with the two colors. The team also engineered the tags so that the green and red colors can be reversed, giving researchers options for future imaging. A paper describing the AggTag method appears online in the Journal of the American Chemical Society. This work was funded by the National Science Foundation, the Burroughs Wellcome Fund, Penn State, the Penn State Huck Institutes of the Life Sciences, and the National Institutes of Health. A paper extending the method to simultaneously detect two proteins appears online in the journal ChemBioChem. This work was supported by the Burroughs Wellcome Fund, Penn State, the Penn State Huck Institutes of the Life Sciences, and the Sloan Research Foundation.